Michael Spaans, a former director of Fonterra and chair of DairyNZ has died. Sadly, today our Co-operative has lost one of our strongest people with former Director Michael Spaans passing away last night. He is survived by his wife Kristina and children Olivia, Logan and Harvey. Earlier this year, Michael decided to step down from the Fonterra Board and focus on trying to recover from cancer. He and I go back many years and I saw him approach his illness in the same way he approached everything in life. He was resolute and determined and did his utmost to continue on as normal. It was a brave fight and I am sure that will not surprise those of you who knew him. Michael was a proud dairy farmer with a passion for our Co-op and our industry. I have often talked about the importance of having leaders developing within our ranks and Michael is a very fine example. Michael served on the New Zealand Dairy Group Shareholder Council, before joining the Fonterra Shareholders’ Council at the time our Co-op was formed. He was also part of the first intake for the Fonterra Governance Development Programme, and later built his governance experience outside the industry including directorships with ASB Bank, Shoof International, DairyNZ, Manuka SA, Waikato Innovation Park, Innovation Waikato and Ospri New Zealand. He then brought this experience, along with a huge level of energy and commitment to our Board, and won the respect of his fellow Directors and farmers for his willingness to listen and engage. Michael was a man who knew the importance of detail. He made sure that he knew this business extremely well, understood our strategy and was completely across the detail of the numbers. He always looked for constructive solutions and thought deeply about our Co-op’s governance and his role in the evolution of our business. His insights and experience — along with his genuine interest and inquisitive mind — were also invaluable on Fonterra’s Milk Price Panel, the Co-operative Relations Committee, and the Audit and Finance Committee. As late as last month, Michael was working for the betterment of New Zealand farmers in his capacity as Chairman of DairyNZ. He has also remained an ambassador for Fonterra on the international stage and in Wellington, recently speaking at the United Nations in New York on behalf of the Global Dairy Platform and all farmers. We have lost a close friend, leader and an advocate of our industry much too soon. Our thoughts and deep gratitude for all that he contributed go to his family. It is with great sadness that DairyNZ acknowledges the passing of (Reindert) Michael Spaans (54), husband, father, farmer, director, and recent chair of DairyNZ. Michael has been a valuable member of the DairyNZ board since 2008 and was elected chair in November 2015. He was also a director of Fonterra from 2013 until January 2017 when illness forced an early retirement. However, he continued on as a director of ASB and Shoof International, and with his farming interests in Canterbury, Chile, and the United States, as well as his home farm. Growing up on a family farm at Tauhei, near Morrinsville, Michael attended Mangateparu School, Morrinsville Intermediate and Morrinsville College. He later took over his parents’ farm at Manawaru, residing there with his wife Kristina and their three children, now aged 16, 20 and 22, until his passing. A keen basketballer as a young man, Michael started farming life in Te Aroha as a young sharemilker, getting into governance around the time of the creation of Fonterra. He started with the old New Zealand Dairy Group shareholders’ council and continued to serve as Te Aroha Ward rep when the council and company became part of Fonterra. From there he has held many governance positions, dedicating his life to improving farming in New Zealand. 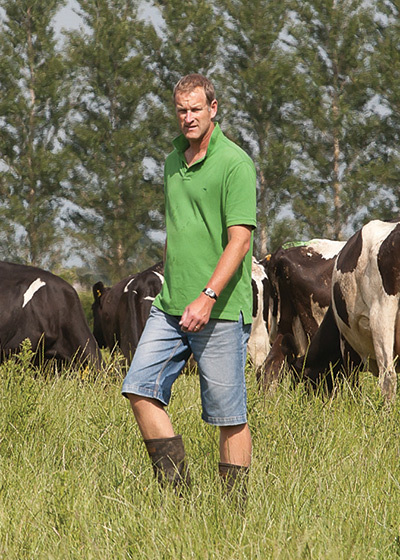 “Michael always had presence and not just because he was 6ft 9in tall, but because he was thoughtful, considered, and passionate about farming,” says DairyNZ’s chief Executive Dr Tim Mackle. “Besides his love and dedication to his family, he was also dedicated to DairyNZ, even ill, he made such an effort to add value to our organisation. He felt and was often quoted as saying how vital an organisation like DairyNZ was to act in the best interests of farmers, and the DairyNZ family are going to miss him. A replacement chair of DairyNZ will be announced shortly, along with a replacement solution for a new farmer director. Fifty four is far too young for a good man whose death will leave a large hole in his family and circle of friends. Farming will also miss his contributions as a farmer, director and community stalwart. WHEN it came to work ethic, it would be hard to look past legendary North Otago market gardener Reggie Joe. For more than 45 years, Joe’s Vegie Stall on State Highway 1 at Alma has been a landmark. From humble beginnings as a small roadside stall with an honesty tin, the business expanded to a busy operation, attracting a loyal following of customers. His wife Suzie acknowledged it was his garden and customers that Mr Joe put first, followed by his family for whom he did it all. His ambition in life was simple; to create a better future for his four children. Having known hardship firsthand, he was determined they would receive a good education. Mr Joe died peacefully, surrounded by his family, in Dunedin Hospital on June 8, aged 82. . . INSIGHTS ABOUT THE NEWS – The divide between regional and urban politics is being thrown into ever sharpening contrast as the election campaign unfolds. Agricultural industries and rural communities feel under siege in the looming election. As reported in Trans Tasman’s sister publication The Main Report Farming Alert, weeks ago the chances of a Labour-led government seemed unlikely, but now the chance of this happening seems possible with policies which could prove ruinous for NZ’s main export industries. Labour will tax users of water, including farmers (but not those companies using municipal supplies). Both the Greens and Labour are committed to bringing agriculture into the emissions trading scheme and say the carbon price should be higher. They have not stated how high they want animal emissions to be taxed. . . Farming leaders representing 80 per cent of the industry have pledged to make all New Zealand rivers swimmable, although they don’t say how or by when. Confessing that not all rivers were in the condition they wanted them to be, and that farming had not always got it right, the group said the vow was “simply the right thing to do”. Launching the pledge by the banks of the Ngaruroro River in Hawke’s Bay, spokeswoman for the group and Federated Farmers president Katie Milne said the intent behind the commitment was clear. . . Agricultural leaders have, for the first time ever in New Zealand, come together to send a strong message to the public. We are committed to New Zealand’s rivers being swimmable for our children and grandchildren. DairyNZ chair, Michael Spaans, says “this is a clear message from New Zealand’s farming leaders that we want our rivers to be in a better state than they are now, and agriculture needs to help get them there. “I have joined my fellow leaders to stand up and say that I want my grandchildren, and one day my great grandchildren, to be able to swim in the same rivers that I did growing up. . .
A new pledge by farming leaders to improve the swimmability of New Zealand’s rivers has been welcomed by Primary Industries Minister Nathan Guy and Environment Minister Dr Nick Smith. “This pledge from farming leaders shows the real commitment farmers have to tackling these long term issues,” says Mr Guy. “Farmers are closer to the land to the land than nearly anyone else, and they care deeply about leaving a good legacy for their children. . . When a book on the history of the Wilden settlement is launched this month, it will also serve as a reunion. Wilden — The Story of a West Otago Farming Community — has been written by Dunedin man Dr David Keen. The driving forces behind the project were retired Wilden farmer Bill Gibson, now living in Mosgiel, and Neil Robinson, from Wanaka. In the late 1860s, the discovery of gold at Switzers, now Waikaia, further sparked West Otago’s development. . . Growing up on a sheep and beef farm in Invercargill, Lucy Griffiths and her siblings were not allowed to leave home without a woollen garment. The many benefits of wool were drummed into them from an early age, not only as a fibre to wear but also as one to walk on and use in innovative ways. But somewhere since then, strong wool had “lost its gloss”, and Mrs Griffiths wants to play her part in re-educating consumers about those benefits. She is one of three new appointments to the board of Wools of New Zealand, a position she felt was a “big mantle of responsibility”. . .
New Zealanders are generally though of as pretty relaxed; but having spent ten days here it’s clear that the current debate around farming is anything but. From the Beehive (NZ’s parliament) to the kitchen tables of farmers, there is a very strong sense of tension. Most I talked to present farmers on one side and ‘townie’ environmental groups on another. The main cause of the tension is the state of New Zealand’s water quality. This issue has jumped up the public agenda over the last 10 years and is now a pretty substantial issue in the upcoming election. Environmental groups, notably Greenpeace have done much to start this debate and the impact of their ‘dirty dairy’ campaign can even be felt in the UK. . .
My great-grandfather fed 19 people, my grandfather fed 26 people, my father feeds 155 people I will feed 155 and counting . . . embracing technology a family tradition. Thousands of salmon have been killed during a burglary at a salmon farm on the West Coast. Police are investigating the burglary at the South Westland Salmon Farm and Cafe in Paringa on Saturday. Offenders entered the farm grounds that night and tampered with machinery on site. The police said the intruders shut off the water supply to the salmon-rearing tanks, causing at least 13,000 fish to suffocate from a lack of oxygen. . .
As the world’s population grows, so too does urbanisation. Towns turn into cities, houses into apartment blocks and the gap between urban and rural broadens. However the divide left is not just physical. It also creates a void of knowledge about what goes on in our rural communities. Today’s urbanised generations are arguably more informed than ever. Thanks to technology, information is at our finger tips, and there are plenty of other opportunities to learn. Advertising is a multimillion dollar business for a reason. A few seconds air time is all it needs to cast a net on an audience, influencing their thoughts with the end goal of enticing them to buy a product, or view the world through a different lens. . . Returning Officer Warwick Lampp, of electionz.com Ltd, has declared the final results of the 2016 elections for the Fonterra Board of Directors, Directors’ Remuneration Committee, Fonterra Farmer Custodian Trustee and Shareholders’ Council. Shareholders voted to elect incumbent Director Michael Spaans and new Director Donna Smit. Stuart Nattrass was unsuccessful. Donna Smit lives and farms at Edgecumbe, and has built and owned seven dairy farms in Eastern Bay of Plenty and Oamaru. Donna is a Director of Ballance Agri Nutrients and Primary ITO, and a Trustee of Taratahi Agricultural Training Centre and Eastern Bay Energy Trust. Donna is a Chartered Accountant and was Company Administrator at Kiwifruit Co-operative EastPack for 24 years. . .
A giant lake and three-metre-high wall have been created on a family farm near Waiau, revealing the massive power of November’s earthquake. Geotech scientists from around the world are scrambling to see the newly formed ‘Lake Rebekah’ and the ‘Waiau wall’ on the Kelly family’s farm. The family is dwarfed by the sheer size of the rupture that’s torn straight through their property, forming a giant wall hidden in the hills of the farm. . .
Primary Industries Minister Nathan Guy has welcomed an investment of $165,000 from Crown Irrigation Investments to scope irrigation scheme options in Northland. “This is great news for a region that has suffered numerous droughts over the years,” says Mr Guy. Northland Regional Council are also investing in the study which will focus on potential irrigation options in the mid North and Kaipara areas. . . Rural insurance company FMG estimates that at least $40m of claims will be made from the 7.8 earthquake and aftershocks. FMG’s Chief Operations Officer Conrad Wilkshire said the firm insured about half of the farms and rural businesses in the Kaikōura, North Canterbury and Marlborough districts. Mr Wilkshire said so far they had received about 700 insurance claims from 500 businesses. . .
Kotahi, the country’s largest export supply chain collaboration, has signed a long-term partnership with Cape Sanctuary, a significant wildlife restoration programme at Cape Kidnappers, in a bid to protect native New Zealand birds. Cape Sanctuary Co-founder Andy Lowe said Kotahi’s partnership will allow two additional New Zealand native species, the near extinct Shore Plover and endangered Blue Duck, to be included in the Cape Sanctuary programme. “Our philosophy is to develop long-standing partnerships with businesses, iwi and Department of Conservation to restore native bird life to our region. Cape Sanctuary began as a project by people passionate about bringing back and sustaining native species that once would have existed on the Cape Kidnappers peninsula and nearby coastal communities. . .
A long-term plan for the future management of New Zealand’s most valuable snapper fishery has been accepted by Primary Industries Minister Nathan Guy today. “The Snapper 1 Management Plan is the result of more than two years hard work by the SNA1 Strategy Group, which is made up of members from the customary, recreational and commercial fishing sectors,” says Mr Guy. “This fishery includes Bay of Plenty, the Hauraki Gulf and the eastern coast of Northland and is one of our most iconic inshore fisheries. It’s pleasing to have a range of perspectives sitting around the table and coming up with a long term plan for maximising the benefits for everyone.” . . Leading Central Otago winery Wooing Tree Vineyard has today released plans that will enable the development of a boutique residential and commercial space designed to complement its wine business in Cromwell. A zone change will need to be granted by the Central Otago District Council (CODC) to facilitate the development of the proposed Wooing Tree Estate, which is pegged for the vineyard’s 26-hectare site between SH6, SH8B and Shortcut Road. While Wooing Tree Vineyard will remain at the site, the new development could include various community amenities, tourist attractions, retail, accommodation and prime housing lots. . .